This interdisciplinary approach combines the chemistry and engineering involved to describe the conception and improvement of chromatographic processes. The book covers recent developments in preparative chromatographic processes for the separation of "smaller" molecules using standard laboratory equipment as well as the detailed conception of industrial chemical plants. Following an introductory section on the history of chromatography, the current state of research and the design of chromatographic processes, the book goes on to define the general terminology. There then follow sections on solid materials and packed columns process concepts. Final chapters on modeling and determination of model parameters, the design and optimization of preparative chromatographic processes and chromatographic reactors allow for the optimum selection of chromatographic systems. Essential for chemists and engineers working in the chemicals and pharmaceutical industries as well as for food technologies, due to the interdisciplinary nature of these processes. Henner Schmidt-Traub has gained 15 years of industrial experience in plant engineering. Since 1989 he has been Professor for Plant and Process Design at the Department of Biochemical and Chemical Engineering, University of Dortmund. His main areas of research focus on preparative chromatography, down stream processing, integrated processes, plant design and innovative energy transfer. "I would not hesitate to recommend it to anyone working in this field." "Overall the coverage is a bit uneven - nevertheless the volume does compile some useful material... In conclusion, this is a comprehensive reference text, which should find its way into the libraries of all companies who are serious about process scale preparative chromatography, whether internally or via outsource contracts." 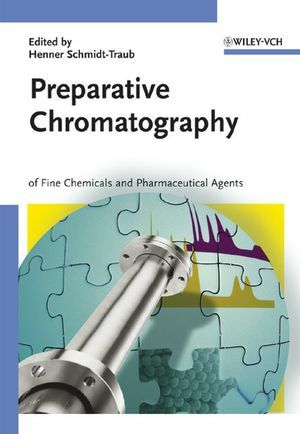 "This special volume is essential for chemists and engineers working in chemical and pharmaceutical industries, as well as for food technologies, due to the interdisciplinary nature of these preparative chromatographic processes."